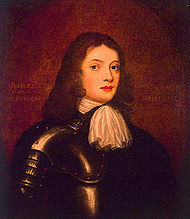 which was granted to Admiral William Penn, (father of the founder of Pennsylvania U.S.A.) by Cromwell. Enters Christ Church College, Oxford University. He is fined for having services at the home of Dr. Owen, the former Puritan head of Christ Church instead of at Chapel. He comes under the influence of the Quaker, Thomas Loe. He is expelled from Oxford for having his own services in his room instead of attending Chapel. He father beats him for this. He leaves on a grand tour of Europe with the Earl of Crawford. Louis XIV receives them at court. That autumn in Anjou he begins studies for a year at the Huguenot Academy. He leaves in 1664. He resumes his travels in the company of Robert Spencer. He meets Robert’s uncle, Algernon Sidney, in exile in Turin, Italy, for his views on political liberty. By August he had returned to London, as his father prepares the Royal Navy for war against the Dutch. Begins to prepare for a career in law at Lincoln’s Inn, Chancery Lane, London. Sails with his father and the Duke of York on war vessels against the Dutch. Before the engagements, he is sent home with dispatches for the King. His father wins a battle at sea and the plague (1665-1666) visits London. The ministers of the established church flee London and Quakers preach from their pulpits. William resumes the study of law. He begins the practice of law in Ireland. He goes with his friend Lord Arran to quell a rebellion at Carrickfergus. William shows coolness and courage in battle. He has his picture painted in armour. William returns to London to find the city in ruins from the Great Fire (Sept. 2, 1666). He converts to the Quakers in Ireland. On the 3rd of September, he and the other Friends attending meeting at Cork are arrested. Late that year he leaves for London for a confrontation with his father about his newfound religion. He travels there with Josiah Coale, newly returned from America. Coale discusses setting up a utopia in America with him. He meets George Foxin London. His father tries to disown him, but cannot bring himself to do it. He debates the Presbyterian minister Thomas Vincent with fellow Quaker George Whitehead. He writes the pamphlet “The Sandy Foundation Shaken.” For it, he is sent to the Tower of London without trial at the urging of the Bishop of London. The Sandy Foundation was written as a response to accusations of blasphemy by a dissenting minister, Thomas Vincent. While imprisoned he writes “No Cross, No Crown.” He writes the pamphlet “Innocency with her Open Face”, which is received by the King as satisfaction for “The Sandy Foundation Shaken,” and after which Penn is released after about eight months in the Tower in July, 1669. In September he begins courting Gulielma Springett, step-daughter of the Buckinghamshire Quaker, Isaac Pennington. Gulielma’s mother Mary had first married Sir William Springett who had died in the English Civil War. He becomes known as a Quaker minister and writer. he wins the freedom of all the Quakers imprisoned in Ireland. Meanwhile, in England the Conventicle Act (1670) was renewed and a severe persecution of Quakers and Baptists begins. This act was supposed to prevent seditious conventicles, but was really intended to suppress religious meetings conducted “in any other manner than according to the litrugy and practice of the church of England.” “This act”, says Thomas Ellwood, “broke down and oerran the bounds and banks anciently set for the security of Englishmen’s lives, liberties, and properties, namely, trials by jury; instead thereof, authorizing justices of the peace (and that too, privately, out of sessions) to convict, fine, and by their warrants distrain upon offenders against it, directly contrary to the Great Charter.” In June 1670 he returns to England. He is reconciled with his father. a principle of law established by this trial. It took a year for this resolution of the case. A transcript is on-line at www.constitution.org. Amongst the comments of the court officials in the transcripts are favourable comments about the Spanish inquisition. Here is a link to someletters he wrote his father while in Newgate prison. These letters show that Penn was quite conscious of playing his part in an act of civil disobedience aimed at securing the rights of all Englishmen in trial by jury. His father dies at his residence at Wanstead, Essex. Penn inherited an annual income from his father’s estate of about 1500 pounds. He is arrested again for speaking at Quaker meeting with Thomas Rudyard and he is imprisoned at Newgate until August, this time without benefit of a jury trial. His official offence was refusal to take the oath of allegience to the crown (Quakers would not take any oath). He sees George Fox off on Fox’s trip to America. He marries Gulielma Springett at King’s Farm, Chorley Wood. The marriage proves to be strong and affectionate. They take up residence in Rickmansworth in Hertfordshire. Penn travels to meetings in Kent, Sussex and Surrey. Penn, Giulielma and George Whitehead participate in Religious meetings in Bristol where they welcome George Fox back from America. Later in London, Penn, Whitehead, George Keith and Stephen Crisp debate Jeremy Ives, Thomas Hicks and others on theological beliefs of Friends with over 6000 in attendance. 1677 The King passes a law of Indulgence, suspending the laws passed against the non-Conforming religious groups. This respite is brief as parliament will soon reinstate them and pass the Test Act. Penn’s daughter Gulielma is born and dies. Penn obtains from Lord Baltimore an agreement excusing Quakers in Maryland from the requirement of taking oaths (1673). Penn writes “England’s Present Interest Considered” (1675), an argument that religious tolerance leads to prosperity and follows from fundamental English law. The Quaker Edward Byllynge buys West Jerseywith John Fenwick his agent (1675) from Lord Berkeley. Penn is called to mediate a dispute between Byllynge and Fenwick. Fenwick sails with his family and others and founds Salem, New Jersey. Penn becomes a trustee for New Jersey. Penn writes a The Charter or Fundamental Laws, of West New Jerseythat includes freedom of conscience, an assembly elected by the people and true trial by jury adapted in 1676. Five more ships sail to New Jersey and the city of Burlington is founded. They buy the land from the Native Americans. A new wave of persecution breaks out in England. Fox is imprisoned. Penn is imprisoned three times between 1673 and 1678. He meets with the Duke of York (a Catholic who later becomes James II) who takes up the cause against religious intolerance. Fox is released after delays. He moves to Worminghurst in Sussex. Penn accompanies George Fox on a trip to Holland and Germany with George Keith, Robert Barclay, George Watts, John Furley and William Tallcoatt. They are well received by Princess Elizabeth Palatineof the Rhine, Charles II’s first cousin. They spend time at Crisheim, Germany where a Quaker meeting had been already established and preach all over the Rheinlands. Penn’s home is Worminghurst and he attends meeting at Coolham and sometimes at Horsham. In March 1678 Penn goes before Parliament to plead for legislative relief from religious persecution. Parliament is dissolved before it can act and a new one instated. Penn campaigns for the Whig candidate Algernon Sidney, a radical pro-democracy candidate, who has returned from exile. The Quakers are on the outside in politics — the Protestant Whigs persecute them for religion and the Royal party (Tories) because they are Whigs. Thousands of Quakers are in prison, where over 300 die since Charles II takes the throne. Charles II owes the Penns 16000 pounds for money loaned him by the admiral, William Penn Sr., and Penn Jr. writes to the King asking for land in America as payment. The Duke of York and Robert Spencer, his old friend, who is now the Earl of Sunderland, supports him. The King signs over Pennsylvania to William Penn and names the colony after Penn’s father. About 3000 persons of European descent (Swedes, Dutch and Quakers from New Jersey) lived in Pennsylvania at this time. He sends his cousin William Markham to America to act as his agent. He writes “Some Account of the Province of Pennsylvania in America.” His price for land is set at 100 pounds for 5000 acres and an annual quit-rent of a shilling for each 100 acres. He orders his manor of Pennsbury to be built in Bucks county, Pennsylvania. He writes to the Indians, asking for peaceful relations, acknowledging wrongs done them by previous European immigrants in other colonies. His instructions on dealing with the Indians: “Be tender of offending the Indians…To soften them to me, and the people, let them know you are come to sit down lovingly with them…Be grave, they like not to be smiled on.” He issues instructions for the planning of Philadelphia which was to include “gardens or orchards or fields, that it may be a green country town, which will never be burnt and always be wholesome.” In the spring of 1682 he writes his Frame of Government for Pennsylvania. He consults with Algernon Sidney and John Locke in drawing up his Frame. Sidney complains that Penn keeps too much power for himself and Locke that he gives too much to the people. Penn’s Frame survives to become the model for most state governments in the United States, the United States Constitution and the Bill of Rights. In the preface Penn writes, “Government seems to me a part of religion itself, a thing sacred in its institution and end…And government is free to the people under it, whatever be the frame, where the laws rule and the people are a party to those laws; and more than this is tyranny, oligarchy, or confusion…As governments are made and moved by men, so by them they are ruined too. Wherefore governments rather depend upon men than men upon governments. Let men be good, and the government cannot be bad. If it be ill, they will cure it. But if men be bad, let the government be ever so good, they will endeavor to warp and spoil it to their turn.” The Frame includes religious liberty (it is intolerance that is unlawful), an assembly elected by the people to make the laws, trial by jury, and a penal system designed to reform, not merely to punish. There were only two capital crimes — murder and treason. He denies a request for a monopoly on the Indian trade in Pennsylvania. He sails on the Welcome to Pennsylvania. Smallpox breaks out on board. Penn, who had already had the disease at age 3, administers to the sick. 31 of 100 passengers die. Penn lands at New Castle on 27 October (Delaware is also owned by Penn, and was at that time part of Pennsylvania), and begins a stint as Governor. He changes the name of Upland to Chester. He goes to the site of Philadelphia and lands at Dock Creek (site of George Guest’s Blue Anchor tavern). He meets with the Indians and participates in foot races and athletic contests with them. He makes his headquarters a mile from Philadelphia in the home of Thomas Fairman at Shackamaxon. He modifies the plans for Philadelphiaand orders that streets running north and south are numbered and those east and west named after trees. The main north-south street he names Broad and the main east-west street he names High (now Market St.). He buys the rest of New Jersey (with partners) from the Carteret estate. He meets with the Indians at Shackamaxon (Penn is named by them Onas, the pen). The treaty (written or unwritten) made that day endured until 1737 and the Walking Purchase, and a period of unusual harmony between European settlers and the Native Americans begins in Pennsylvania and Jersey (see. xroads.virginia.eduweb page). He attempts to resolve a boundary dispute with Lord Baltimore and Maryland, but is not successful. Penn visits Friends’ meetings in Maryland. Twenty-three ships arrive with passengers for colonization of Pennsylvania. Thomas Lloyd and Francis Daniel Pastorius arrive on the “America”, highly educated men who become friends of Penn’s. On October 8, 34 German Quakers arrive on the “Concord” and found Germantown. Penn writes a letter describing the province of Pennsylvania in 1683. Algernon Sidney is executed for taking part in the Rye House plot. Penn concerned with his wife’s health, the boundary dispute with Lord Baltimore, and worsening political situations in England, returns to England, embarking on 12 August, 1684. Thomas Lloyd is made President of the Council in Pennsylvania in his place. William Markham is made provincial Secretary, and James Harrison is left in charge of Pennsbury. He lands at Wonder in Sussex on 6 October, 1684. Charles II dies and the Duke of York takes the throne as James II. The king declares himself a Roman Catholic. He puts down a rebellion by the Duke of Monmouth. Part of the boundary dispute (the Maryland/Delaware line) is resolved. Penn gets pardons from the king for John Locke and John Trenchard. He becomes known as an influential friend of the king. The king issues a general pardon, and all religious prisoners are released, including 1300 Quakers. He visits William of Orange in Holland to inquire on the king’s behalf about his views on religious liberty. Penn’s expenditures on Pennsylvania are 3000 pounds greater than his income from Pennsylvania. Penn’s family takes lodgings in the Holland House, Kensington. James II issues the Declaration of Indulgence and suspends the laws against religious tolerance. The king is seen as usurping the authority of Parliament to pass laws. James II places 7 bishops in the Tower, who are later acquitted and released. William of Orangelands at Torbay in Devon. By December James II has fled to France and William and Mary are king and queen of England. William Penn is arrested as a friend of James’, but is released on bail and acquitted. Parliament passes the Act of Toleration, guaranteeing religious freedom in England (except that the Test Act remains in force). The William Penn Charter School is set up in Philadelphia with instructions to educate all, and charge according to ability to pay. George Keith is the first schoolmaster. Penn is arrested for corresponding with James II. He is acquitted again. James II lands in Ireland. Penn is arrested under orders from Queen Mary. He was brought to trial, but nothing could be found against him. George Fox dies in London. Penn speaks at his funeral. Penn goes into hiding just after the funeral and charged with treason. Quarrels over religion begin in Pennsylvania among the Quakers, partly stirred up by George Keith. In 1692, the king takes Pennsylvania from Penn and places it under the Governor of New York. He is declared a traitor in Ireland and his estates forfeited to the crown. Penn is exonerated, with the help of his friends including Henry Sidney, Lord Rochester, Lord Ranelagh and John Trenchard (now Secretary of State). Pennsylvania is returned to his authority. William Markham is Deputy-Governor of Pennsylvania in Penn’s place. George Keith returns to England and becomes an episcopal minister. He marries Hannah Callowhill, daughter of a Quaker, Bristol merchant. Penn meets with Czar Peter the Great in London. The Czar attends Quaker meeting at Deptford. He goes to Ireland with son William and Thomas Story, where some of his Irish estates had been reinstated to him. He preaches the Quaker doctrine in Ireland. Thomas Story leaves for America. Penn and his family go to Pennsylvania, accompanied by James Logan. They arrive in December. They stay at the home of Edward Shippen for a month. In the spring of 1700 the family removed to Pennsbury Manor. He visits Lord Baltimore. He visits the Indians at Conestoga. In 1701 the three slaves at Pennsbury are freed. Some, but not all Friends follow his example and free their slaves. Penn had by this time lost 20000 pounds on Pennsylvania. a proposal to turn over the proprietary colonies to the crown, forces Penn to return to England, November 1701 on the ‘Dalmahoy’. In September a new “Charter of Privileges” is passed by the Pennsylvania Assembly, much like the old one but with two important changes. The Assembly is allowed to propose new laws, not just vote on them (which before only the Governor’s Council could do), and the Province and Territories (Delaware) were allowed to split their governments. He appointed Andrew Hamilton deputy-Governor in his stead, and James Logan became provincial Secretary of Council. Hamilton worked secretly against Penn with the Lords of Trade and Plantations. John Evans replaced Hamilton, after Hamilton dies, and is not a good deputy-Governor. Queen Annetakes the throne, and is friendly to Penn. He unsuccessfully tries to save Daniel Defoe from the pillory. His son William goes to Pennsylvania and engages in a tavern brawl with his friend deputy-Governor Evans against the night watch. Son William leaves the Society of Friends and takes up residence in France after the Friends criticize his behavior. The Fords (Quakers of Bristol) foreclose on a loan to Penn and claim Pennsylvania. He is arrested for non-payment of debt. He is freed in December 1708, after his friends and Callowhill in-laws negotiate a deal with the Fords. Governor Charles Gookin is well liked in Pennsylvania, and a new Assembly is elected friendly to Penn. The Assembly passes laws that rights Penn’s finances. A law is passed that heavily taxes the importation of slaves (vetoed by the crown). The Penns move to Ruscombe in Berkshire, and attend meeting in Reading. Penn is stricken by paralysis, which affects his memory. Penn dies and is buried at Jordanswith Gulielma.